I keep mine in a box, I write the name of the colour on the lid, so that I don't have to keep taking them out of the box until I find the colour I'm looking for. And if you're taking them to a workshop/class & you're worried there'll be crystals everywhere if they fall over in transit, stick a small piece of masking tape over the hole. Simples! Okay, onto today's card. No step by step photos I'm afraid. I thought I had taken them, but this was obviously one of those projects where I got completely engrossed in what I was doing. I used Jet Black Stazon to stamp portions of the border stamps from the Limor Webber Rugged Edge stamp set & circle splats the Ink Splats set. 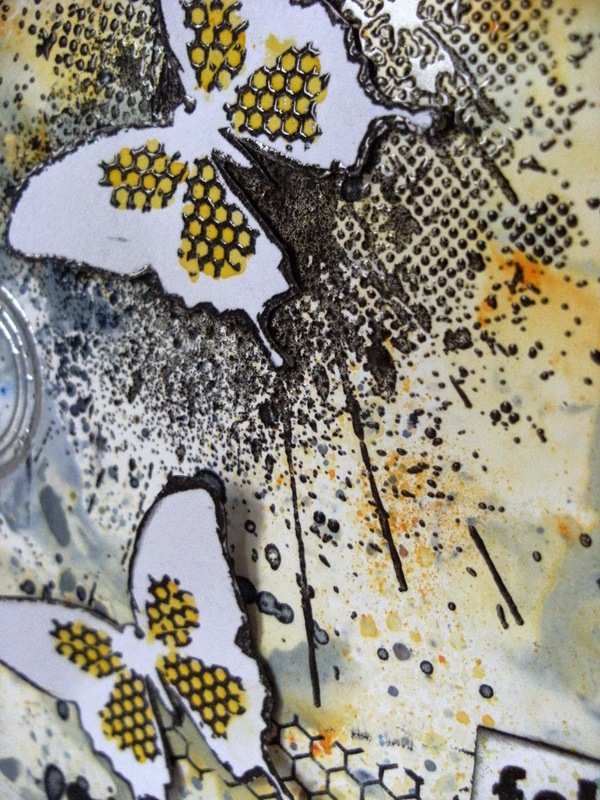 Before gluing on the butterflies I stamped the Limor Circles (back in stock very soon) with embossing ink, applied silver embossing powder & heat set. 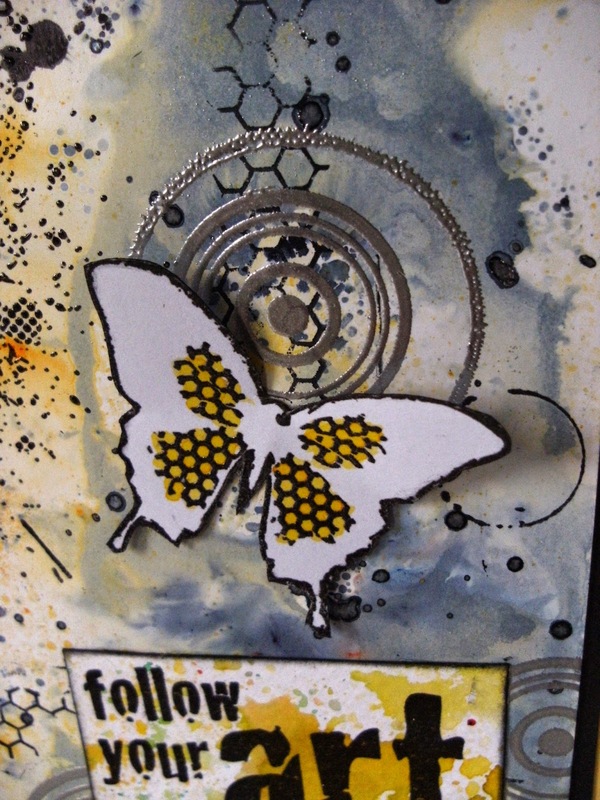 I stamped the Follow Your Art stamp from Stampendous with Onyx Black Versafine onto a test piece of card that was on my desk, cut it out & edged with Black Soot distress ink. Thanks for visiting the blog today. I might be back over the weekend. Until then, take care & happy crafting. Great card, Kirsten - and your tip about cleaning the working surface is a good one, I have been there!! Loving that grunge look! And it's so true these little grains can be invisible until they get wet! What a beautiful card - I really must get some Brushos! 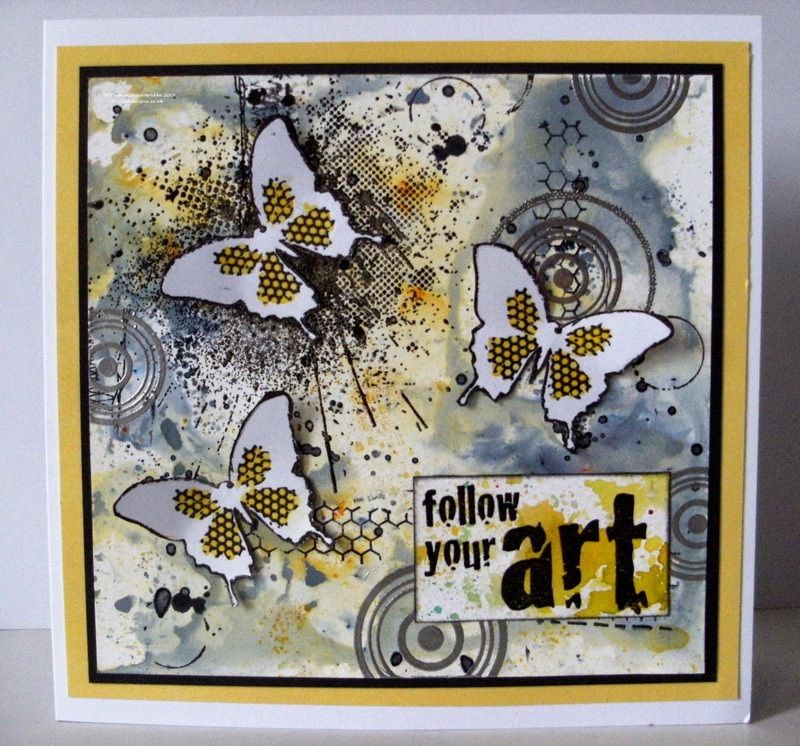 This is such a cool card - the golden tones are fabulous with the bold black graphics, and the whole thing shows off that fantastic butterfly image to perfection.